This painting is about the Emu Dance. The female and male dance for hours (showing off) before they mate. All this happens just before sundown. Then the female lays the eggs, the male hatches them and the mother leaves. The waterhole is the big wiggly circle with smaller wiggly dots. The big quarter circle at the bottom is the sun. The patch dots are the plants and the trees. The wriggly circles with wiggly circles in it is the desert. We are very pleased to offer selected art work by Lionel Phillips. Lionel is one of Australia's most recognized Aboriginal artists. Lionel Phillips art work is steeped in Aboriginal symbolism. Each painting tells a story he learned from his family. 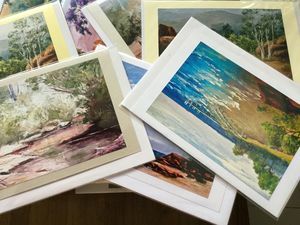 We supply authentic Australian made paintings and gifts that are hand made by local artisans from many parts of Australia.